Daytona Beach, FL – As an unseasonable cold winter and spring has many Floridians dreaming of warmer days, Daytona Lagoon has made moves to ensure the upcoming season is the best one yet. 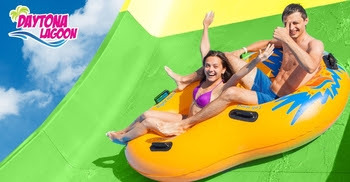 Central Florida’s favorite waterpark and family entertainment center has added two new major water slides for the 2019 season. “There’s nothing much better than a new waterslide opening, except for two brand new waterslides opening!” exclaims Tyler Currie, General Manager of Daytona Lagoon. Shaka Halfpipe is an all-new pendulum-style ride that adrenaline junkies will love. Hang loose on this single or two-person, over-the-edge inner tube experience that propels riders straight up then backwards over a 50-foot half pipe. The high thrill float ride merges the thrill of a freefall and uphill movement in an oscillating sequence that leaves you ready to ride again. Kraken’s Revenge replaces and upgrades Kraken’s Quest, which was damaged by Hurricane Irma. 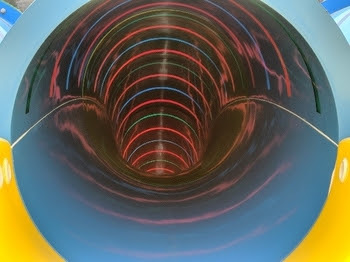 Rising over 50 feet tall, this multi-colored four lane, forward face racing slide offers riders a rush while sliding through a high-speed time warp tunnel and competing against each other. The sky-light rings used to create the tunnel effect are the first of its kind for Central Florida. The nearly 1.5 million-dollar collection of off-season park improvements also include a new wave maker for bigger waves at the popular Treasure Lagoon Wave Pool, new arcade games for new challenges to conquer including Virtual Rabbids Virtual Reality game, a newly expanded and remodeled retail and redemption store, plus newer, more flavorful food options. “We are so excited for guests to experience some new thrills and our park improvements in 2019, while we maintain our commitment to provide the same family friendly, affordable prices,” continues Currie. The waterslides are now open with a symbolic “ribbon cutting” celebration to take place on Friday, April 26 from 10 a.m. until 11 a.m. to welcome the new water slides. Media is encouraged to attend. Dignitaries, media personalities, and the mascots from the Daytona Tortugas, Daytona’s professional baseball team, will participate in the festivities. The celebration comes almost two years after Volusia County was hit by Hurricane Irma. During this time, Daytona Lagoon was lucky enough to reopen within a week of the storm and became a community gathering spot for those without power. Daytona Lagoon is Daytona Beach’s Premier Waterpark and Family Entertainment Center. The park features a full day of fun for the entire family – whether you zap your friends in Laser Tag, or challenge them to a Go Kart race, or test one’s skills in our MEGA Arcade, take a thrilling plunge down the waterslides, or just relax and float around the lazy river. There is something fun for everyone!